Patricia McKillip is known these days (although perhaps known not quite well enough) for her gorgeous adult fantasy novels, full of beautiful words and worlds. But the first book* she published was not one of those. 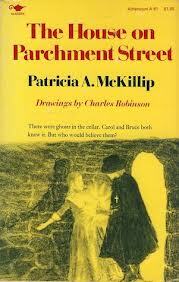 Instead, The House on Parchment Street (1973) is a ghost story for 10-13 year old kids, and it's a good one (with reservations beyond the hideous original cover--what was it about the 1970s that made mustard yellow so popular?). Carol has been sent to stay with relatives in England for a month to expand her young mind. Her aunt and uncle welcome her to the old house on Parchment Street, but the tough boys her cousin Bruce hangs out with are enough to make her want to go back home almost immediately. And then, down in the cellar of the house, Carol sees a ghost--a man in black, disappearing through the wall. When Carol finds that Bruce has seen this ghost too they become allies in solving a mystery from the English Civil War. That's the bare bones, as it were, of the ghost part--it's a fine ghost story, nicely creepy, with gradual realizations and historical clues allowing the kids to figure out what happened back in the past, and culminating in an exciting and dangerous discovery. But the ghost part of the book is interwoven with the contemporary story of prickly friendships, the dynamic between Bruce and his father, Carol's experiences as an awkward stranger in a strange place--lots of character development, in other words. This realistic part of the book almost overshadows the ghost story; the ghosts never get to be people, as it were, but instead seem to be there to give events in the real world a focus. We don't actually find out the historical particulars of what happened, just the general outline of what happened. This bothered me as child--I wanted to know more about the mysterious girl from the past (we never learn her name!) and I think I only ever read it once, despite being a young anglophile, because of being vexed by this. I did, however, enjoy my recent re-read--the place, the people, the story were all satisfying; at this point in my life I am perhaps less dependent on supernatural gratification for my reading enjoyment! I'd recommend this one, then, not so much to the ghost story lover, but to those who enjoy the old-fashioned sort of lonely girl in a strange place stories, if you know what I mean! This sounds good - I'm only familiar with her adult fantasy. I don't remember ever reading this one- but it sounds like a good read. I will have to pick this one up.